By the day, New York Fashion seems to be getting more and more commercial in its ideas. Arguably the most forgettable of the four weeks, this season’s New York collections have been largely uninspired, consumer-friendly and unchallenging—save for a few of course. Tory Burch’s collection this morning was opened by Victoria’s Secret Angel Taylor Hill and the show the ensued was predictable in its ways, but inoffensively simple. There were some colour blocked pieces, fashionable tracksuit bottoms and finely tailored coast in a melting pot of strong colours. More than ever, it is possible that these clothes could be seen on the sidewalks of New York, London, Milan or Paris during fashion month. There was a nice faux-fur accented bottle-green jacket. Her bohemian luxe flavours were also transferrable to street style images, a first. Chairman, CEO and designer of her eponymous label, Tory Burch is a longstanding name on the New York schedule, and with a net worth of $1 billion dollars she is a powerful businesswoman. She was listed as the 73rd most powerful woman in the world by Forbes last year, an honourable achievement. Her fall 2016 collection will serve its customers well with a heap of covetable, wearable pieces. They may not offer much, but these clothes have an undeniable charm. Another woman perennial instinct and potent aesthetic is Vera Wang. The 66-year-old was once senior fashion editor at Vogue, before becoming design director at Ralph Lauren. There is her successful wedding gown endeavours and her namesake label which has been showing on the New York schedule for years. Throughout the years, a defining aspect of Vera’s ready-to-wear that has remained is her undying love for black. 21 out of the 40 looks presented at Moynihan Station featured, or were entirely black. There was thigh high splits, cutouts, tailored tuxedos, pleated gowns. An sober affair, the second half of the collection injected some semblance of lighter hues via militaristic power dressing. Double-breasted blazers displaying a lot of skin, cropped sweaters (perfect for Kendall Jenner, who walked in the show) and floor sweeping skirts. Another recognisable quality of Vera’s collections are the boots and the furs. The designer adores both, and is regularly seen around town in them. The platform boots worn here looked treacherous on the runway: I anticipated a fall, luckily nobody did. The furs were lavish. Dilone’s sleeveless number was in grey and a washed out mustard. Damaris Goddrie’s fur dress was similar, and equally as impactful. Vera’s designs are in the same vein as Burch’s. They’ll undoubtedly sell out. Quickly so. They’re nice, but not very exciting. And every now and then you’ll see something—like the brilliant furs of this collection—that really wows you. The majority of the time it’s just another show. Clapping isn’t all that popular after shows these days. Writers are furiously tapping away at their devices to meet deadlines, influencers are snapping photos or Snapchatting, and others are either photographing the collection or their thoughts are percolating. Is effusive applause warranted these days? It can be. In the case of Stuart Vevers’ latest Coach collection, it is. The clothes weren’t rich in subtext, but had a joie de vivre and put a smile on my face. The smile endured as the sporty het feminine clothes were fun, easy and nice to look at. A talent of Vevers. His clothes may not be the wittiest but he creates them so they appeal to the naked eye. Weak sales will get a firm jolt from this. Prior to the beginning of the live stream, two young men or women were engaged in a game of ice hockey. 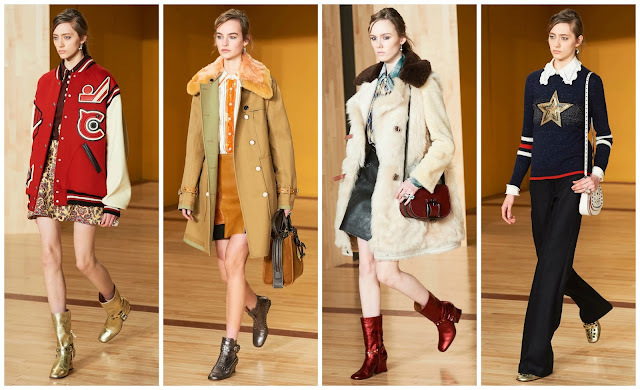 Models from Lia Pavlova to Lexi Boling hit the runway dressed in oversized varsity jackets printed with various badges, emblematic of the Coach club. Underneath were A-line skirts. An 80s road trip picked up fur-lined collar parkas, fur gilets, Western-tinged blouses and skirts, shearling coats and expertly tailored trousers. The cowboy boots were were in various jewel tones: ruby, gold, amethyst. If street style bait was Vevers’ mission, he won. The leather jackets with fur panels and quirky patches, or Peyton Knight’s wool sweater with Native American influences. Tastefully exacted, chic and simple leg-bearing outfits. Referencing Americana is Vevers strong suit. The English designer skilfully delivers points of reference from the colder midwestern states to New York to the wild west to sunny LA. Commercially, they're interchangeable—to be worn in any of the above locations. Uptown meets downtown in Minnesota, Palm Springs, Nashville and New York. His American appeal will be taken international when the mid luxury market sees the arrival of this collection. 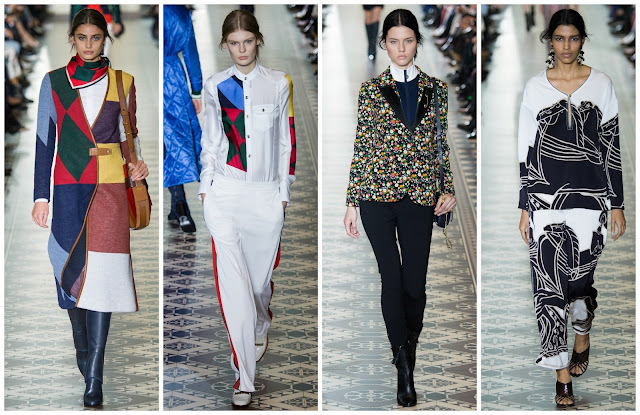 After last season’s unsteady Victoriana by way of the western collection, this sharper display Sports-luxe, not perfected but done better than what’s expected. I’d clap and clap and clap. 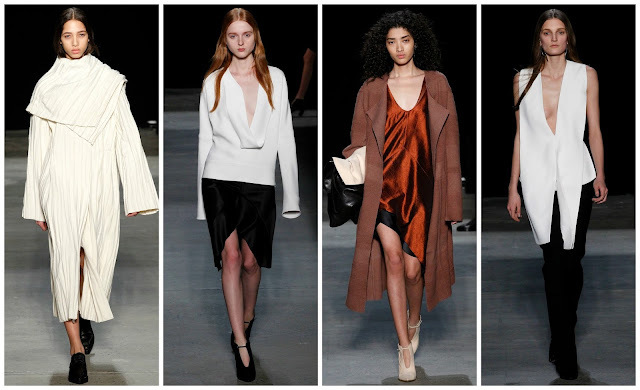 Tuesday night, 8pm has always been reserved for Narciso Rodriguez on the NYFW schedule. 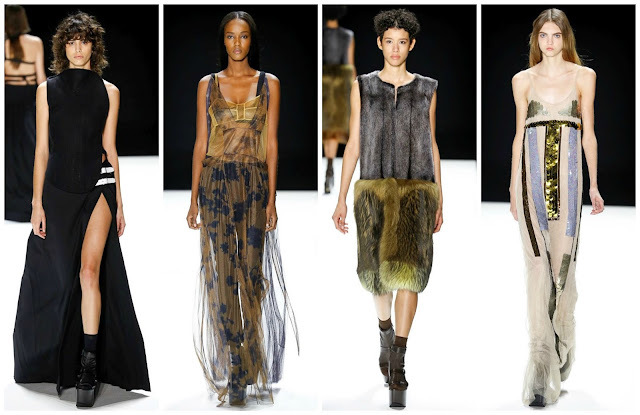 The American designer is famed for designing pieces favoured by First Lady Michelle Obama. His Fall 2015 collection last February was his strongest to date. It was sharply cut, well-structured and had a sublime colour palette. His Spring offering was strong but not as great. Fall 2016 was better than that, a more directional offering. Engineering fabrics into interesting shapes, this collection featured an ever looser spirit than last time. Yasmin Wijnaldum wore a white poncho dress that could’ve been from Mad Max: Polar Road. Maybe it was the blistering summer blockbuster’s main characters that inspired Narciso’s clothing. It had a confident air and a bad girl attitude. The thick wool sweater and asymmetrical silk skirt was stunning and styled with point toe brogues. Large leather parkas exude a sense of see now, buy now, wear now as the New York temperatures plummet. A fabric technician at heart, the cuts were splendid in this collection. There were asymmetric panel dresses with bias cut necklines. One layered golden brown t-shirt was layered upon a skirt which was worn over trousers. Interesting cuts, mostly asymmetric, were paraded on the runway. Maddison Stubbington’s white low-cut top was especially impactful. A lemony crinkled dress and a silky copper top were the best pieces in the collection. Seasonless, essentially, they will look good in November or June. An smart business move. The clothes are far more interesting than the business side. On Sunday night Brandon Maxwell styled client and friend Lady Gaga in an ostentatious Marc Jacobs gown and 6-inch platform, 10-inch heels. On Monday night, last night, Brandon Maxwell presented his Fall 2016 collection to an intimate audience at the Monkey Bar. The switchover is admirable. For his sophomore collection, Maxwell focused on two colours, two wardrobe staples, black and white. There were lovely coats, with layered collars, or a well structured coat and trousers pairing. A white high-neck top with flared sleeves was quite nice, styled simply with black trousers. Maxwell handles effortless yet powerful simplicity finely. His red carpet offerings aren’t weak. The Academy Awards could use some of the gowns at the after parties in a few week. One plunging neckline backless town with side cutouts was simple, soigné and fit for a starlet. A risk taker could take a jumpsuit with a large ball gown and a midriff-bearing cutout or the finale, white strapless jumpsuit. Maxwell wanted women to get a year out of his clothing. This extension of his Spring collection in darker hues felt the excitement lacking. Hopefully by September he’ll inject an electric blue that Gaga wore or a neon orange, like her hair. That will be an intriguing site.